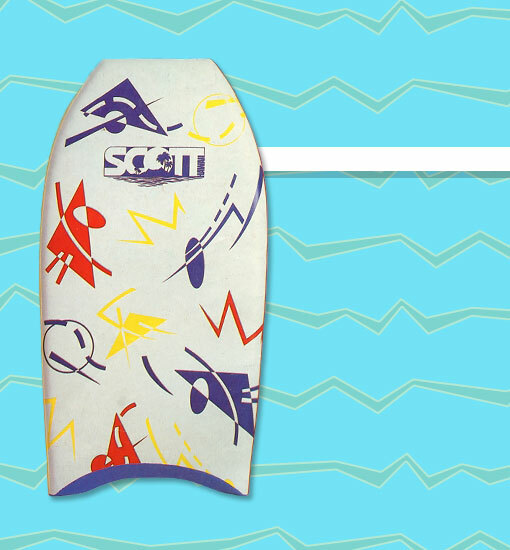 Scott Hawaii introduced the Newtech Jammer boards featuring wild graphics as a way to tap into the funky styles of the 80s. The boards came in two different styles - Mad Graphics (shown) and Jungle Jammers. To prove that beauty runs deep, Scott made sure to pack the board with features like EI Fiberglass stringers, a Speed Skin bottom, and of course, the Newtech Deck. The boards shared the same outline as their popular Scott predecessor, The Bullet.